I logged onto Kayak.com as I was looking for flights between Sydney and Gold Coast. I was meeting a friend up there and we were going to hang out with some frequent flyers. I was psyched. I had tooled around for a bit in getting the tickets and they had gone from 200 AUD to now 260 AUD. Kayak.com had sent me to a local Aussie site called Wegolo.com, but the fare was at 260 AUD. 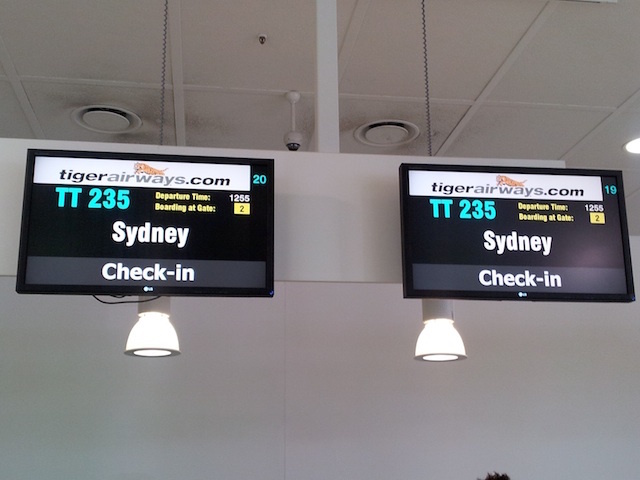 I decided to try to book two one ways and as it turns out departing on Jetstar and returning on Tiger worked out best. 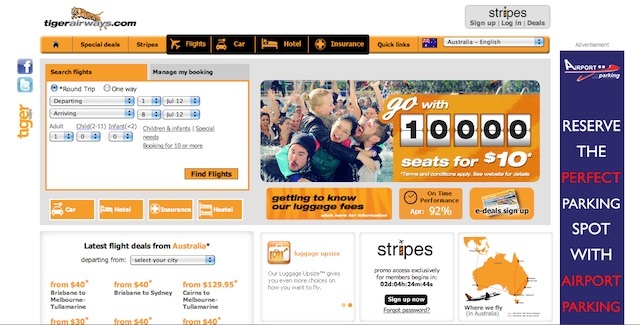 Also, it was better to book the fares on Tiger Airways’ web site rather than Wegolo. The interface is actually very simple and I was able to book with no issues, avoiding the upsells for seats, bag and food along the way. I also had to pay a credit card fee and a online booking fee; unnecessary I thought, but still cheaper than booking on Wegolo.com. When I went to pay the final amount, only the service fee of 7.50 AUD remained. Somehow, thankfully, the credit card fee was not there anymore, oh well. The final total was 107.45 AUD which included the base fare, GST and service fees. I got an email receipt immediately and was glad to know that I did not make any errors that necessitated human intervention. I arrived at the airport at about 11:30a and the check-in area was devoid of anyone except about four people. Soon four young guys walked up the side and jumped in front of me; no worries, I did not really care at all. Doug soon called me forward and asked me for my last name and checked me in. He offered me an Exit row seat before I could ask for a window and before I knew it, I was in 13D. He did ask me to weight my bag though which weighed in at 13kg. He asked if I had a computer, I said yes, so he instructed me to remove it otherwise it would coast me 90 AUD to check my bag. Geez, that was almost the cost of my ticket. I quickly complied. I love Australia; no TSA creeps here at all. No shouting, no take off shoes, jackets, etc. Just take out your metals, hair spray (not sure why), place on conveyor and walk through. No alarms went off so I was good to go. This is a nice terminal with everything all on one level. Its so easy. 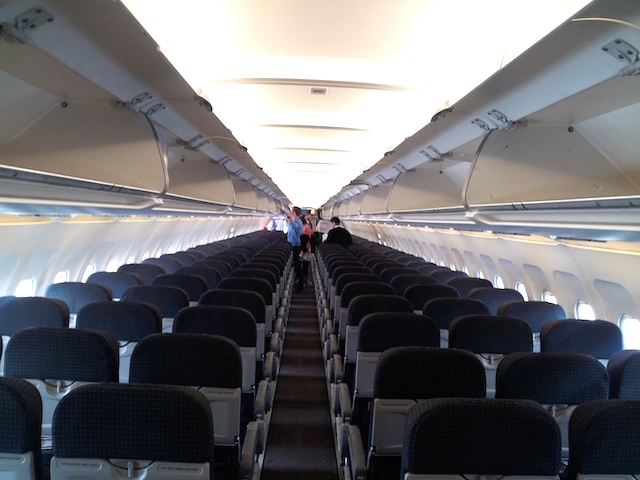 You just walk right out to the planes and up the stairs when ready and you are in the passenger cabin. I seeked out and found The Lounge by Virgin Australia as one of the frequent flyers I met the night before said he was going to check out the lounge and I could be his guest. I asked the lady at the front to go check if he was there, she said yes, so I went upstairs to the Lounge. Its quite a nice lounge indeed. You could tell that Virgin thought about it. As it turns out he was not there, so I retreated downstairs, thanked the lady at the front and exited. Once outside the Lounge, I was right next to gate 2, my gate, so I found a plug and made use of the free Airport WiFi. All the while looking out for my plane to arrive so I could snap a picture. At about 12:20p, this came to fruition as the white Airbus A320 arrived. As I waited, the lady in front of me was adjusting bandages on her knees and ankle as it looked like she had ran the marathon earlier that morning. I was pretty impressed by her. She also had a protein concoction and was talking to someone on the phone about her race performance. 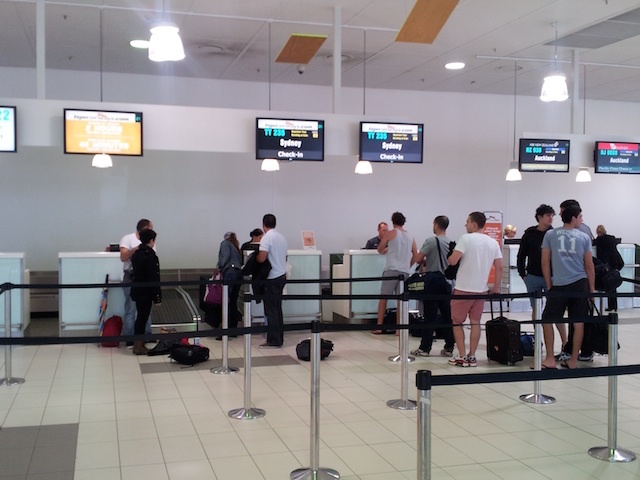 It was time for boarding at about 12:35p; as Doug had specified at check-in, rows 1, 12 and 13 were allowed to board first. 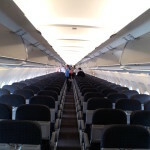 These are exit rows and as you cannot have any bags under the seat or in the seat in front of you, you are allowed to board first so you can put up your stuff in the overhead bins before the others board. This was cool as I had row 13. We waited a little outside before being called forward by the lady on the ramp. I asked if I could board through the rear door and she said yes, so I did. Loved it. I mean how often do you get to do that? Onboard, the interior is devoid of any colors. Just white interior with olive drab cloth seats. I greeted the flight attendant as she inspected my boarding pass and then headed for my seat. I sat in the window hoping that no one would claim it, but alas a young couple showed up, so I was nice and moved to the aisle. It was strange, the guy did not even ask me to move, he and his girlfriend just settled into the aisle and middle seats. Boarding was pretty smooth and within a few minutes it was complete, the doors closed and we pushed back at 12:53p for a 1:02 flight. Looks like we were about 60-65% full on this trip. 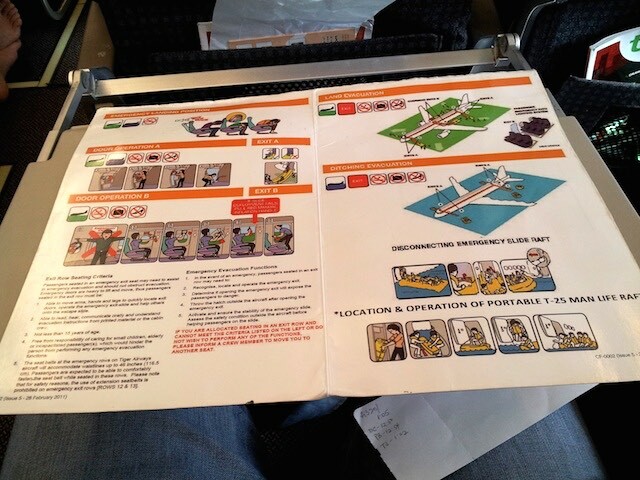 The four flight attendants did the manual demo as the aircraft is devoid of any screens. There were three in the aisle and one on the PA giving instructions. Oh, during the boarding process, the lone male flight attendant had briefed all six of us on the right exit doors all at once. He made us take out the safety card and looked over it and added instructions on how to pop the door and toss it if needed. I read along as I felt that he was going to give us a quiz later. Once the left side filled up, he did the same. We pushed back and taxied out and pretty quickly we were airborne as there was not much air traffic. The pilot had come on the PA earlier and said we’d have a smooth flight and no delays were expected on our way down to Sydney. As we left the ground, I could see the sunny Gold Coast disappear below us quickly. 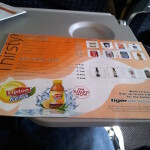 This was easy as it is a requirement of Tiger Airways that the window shades be open for takeoff. Excellent! It was so nice to see the Gold Coast just continue on for a few miles plus the mountains off in the distance. Au Revoir Gold Coast. 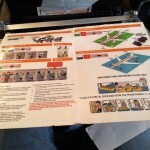 Soon after takeoff, the in-flight service started. 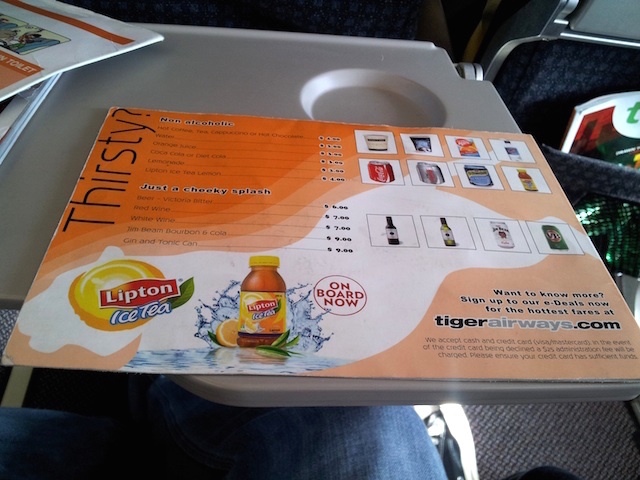 Basically, they were selling the stuff in the in-seat pocket menu. You can purchase with cash or credit card. From what I saw, most people used cash. The items are pretty pricey, so I refrained from purchasing anything, soon falling asleep. 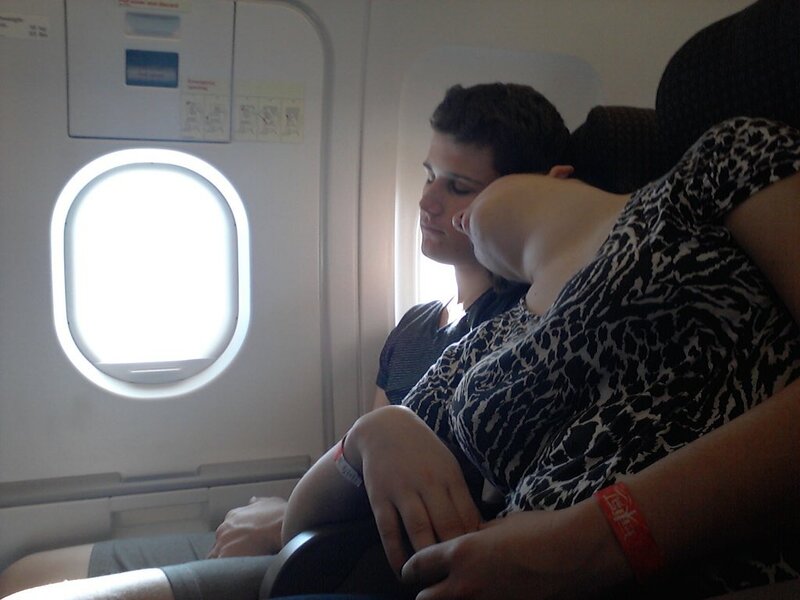 The couple next to me fell asleep before I did though. I guess they had a good weekend in the Gold Coast. Soon, we started our descent, so I un-reclined my seat to prepare for landing. Don’t get excited though as the recline is really nothing. But the Exit row does provide ample legroom. It was a clear sunny day in Sydney, so there were no delays whatsoever. 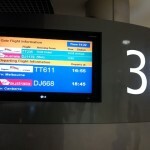 As such, we soon landed and headed for the domestic terminal, where we parked at gate 38. 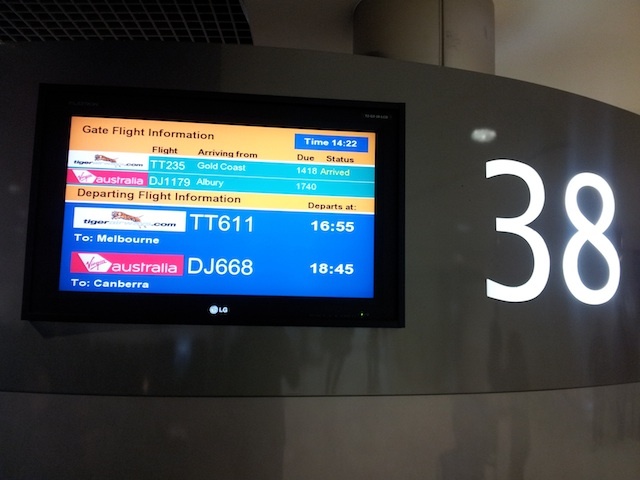 This would be the flight that goes to Melbourne, Australia (MEL) in a few hours. 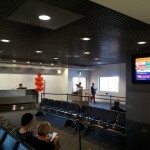 They had some balloons at the gate as I believe that the flight would be the first of an additional service to Melbourne. I’d rate this flight experience a 4 out of 5 planes as, it was routine, there were zero issues and every facet of the experience was almost flawless. I would have felt better had the online check-in experience worked and if I had a kiosk available to for use at the airport on arrival. Not a big issue though as the agent, Doug was superb and took great care of me. 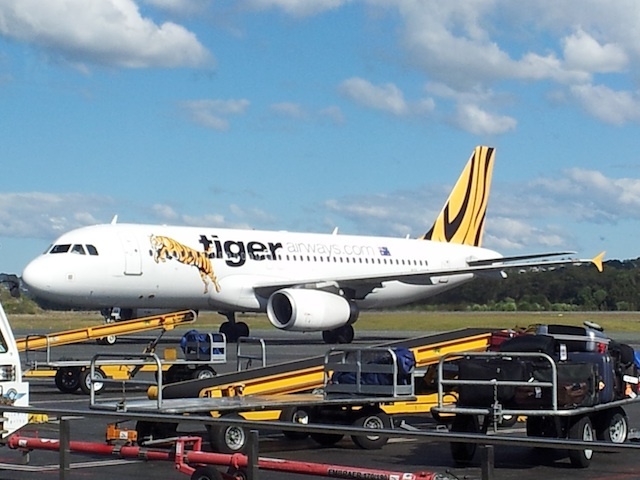 My Aussie friends were warning me about taking Tiger Airways Australia (TT), but I had a great experience and if I needed air travel in the future and the times, price and routings are right, I would consider them. 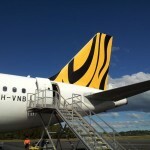 Have you flown Tiger Airways? What are your thoughts? Please leave a comment below and share with your friends. 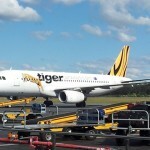 My brief acquaintance with Tiger Air has left such a bitter taste that I will never fly with them again and will strongly dissuade family, friends and colleagues from using this airline. I did not receive timely information about the terminal change at Perth Airport, now departing from the same area as the international terminal. The domestic terminal has always only operated in one area, 11 km away from the international terminal. Needless to say, when I got to the right terminal, I missed my flight, because of Tiger Air’s cost cutting practice of utilizing the same staff for check-in and boarding. This leaves the check-in counter unattended for 45 minutes before flight departure. Their explanation: it is our policy, because we are an on-time airline. 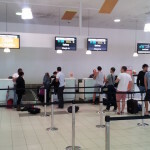 When the same staff returned after the flight left I was stunned by their unprofessionalism. One example amongst others is a staff member verbalizing that she was not in the mood to answer a ringing phone. The 45-minute policy and the consequential standard charge of $85 to book another flight is a nice little money-spinner for Tiger Air. I was only one of 7 people queued up. 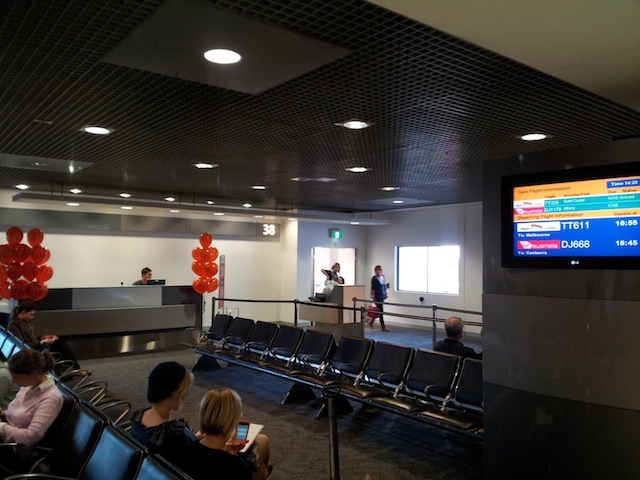 The Tiger Air Arrivals in Melbourne was shocking, being nothing more than a warehouse with a demountable toilet block set up in one corner and a fenced off carousel. 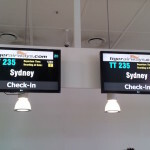 I normally book through Webjet and fly Virgin, Jetstar or Quantas. Over the past 12 years I have never had any issues with regard to correct and timely information, staff members’ level of professionalism or the quality of the service. 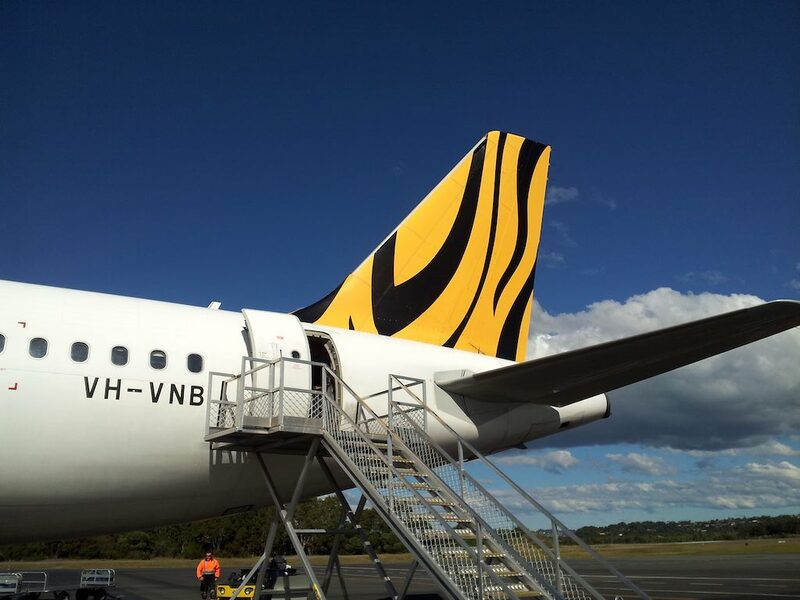 Additionally, the way Tiger Air’s Customer Care dealt with my complaint in recent days can only be described as a brush-off by a company aiming to maximize profit at all costs. Looking at other reviews of Tiger Air it has become clear that booking with them is literally a “lucky dip”. Missing a family Christmas celebration due to Tiger Air has made up my mind for me to never fly with them again.